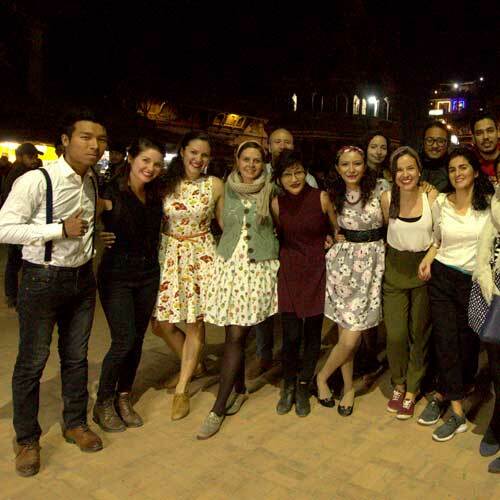 We are glad to see so many people joining our Lindy hop swing dance classes tutored by Maria Lopez, Spain. Lindy hop is an American dance style from New York City from the 1930s which has now resurfaced in parts of Europe and the US. It is our firm belief that if you want to make music, then you must learn to groove to it and enjoy it and that is exactly what we did this November at the Durbar Square. We had a small band playing up-beat swing music. It has a way of emanating good vibes and you can not keep yourself from tapping your feet to the beat. They went out to the Durbar square in Patan and started playing where our crew of Lindy hop dancers joined and got the party going. It is definitely an exhilarating feeling to have so many people enjoying your music and people smiling to you as they pass by on their daily commute. We even had some people dance with us. We routinely have open classes in Lindy hop with our instructor Maria Lopez so you can see how it feels first. Considering the amount of people that have been joining and the many new batches we have been opening recently, we think there is a high probability you will fall in love with these classes. You can join these classes even if you are not taking any of our regular academic courses. Apply now at info@katjazz.com.np or call us at 01-5013554 / 9813556945 to know more!